Are you looking for ways to connect with more customers this holiday season? Of course you are! And I’ve got an idea that’ll help you meet your goals: a Christmas contest or giveaway. Running a Christmas or holiday-themed giveaway is a smart move for any marketer, especially since the competition for views, clicks, and (ultimately) shoppers is high, and a giveaway allows you to get out in front of the holiday craze. Make hashtags a part of the fun by incorporating them in your contest. Use hashtags strategically to market your contest to your brand’s highest-converting and/or largest audiences. 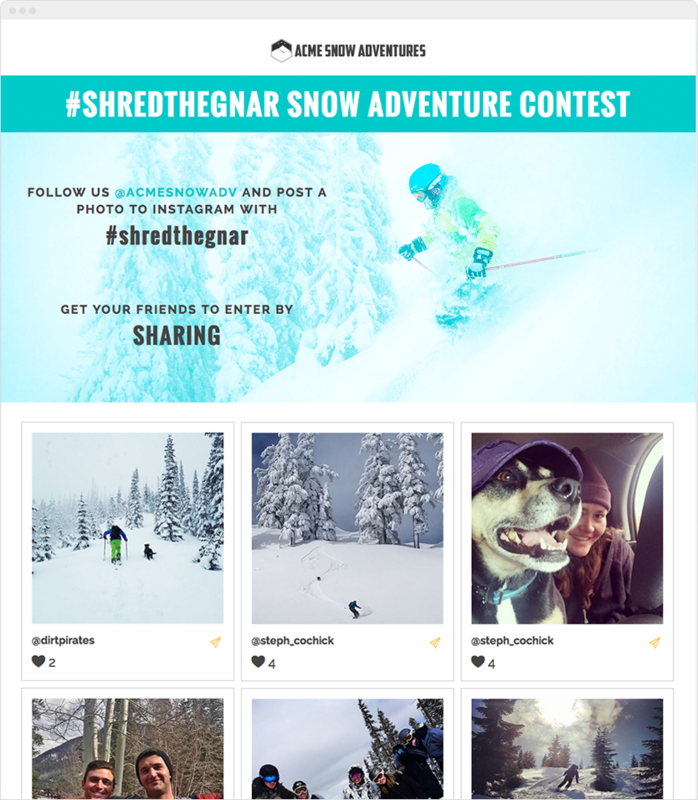 Use a hashtag as part of your contest by collecting entries using a hashtag feed. For this giveaway, entries are collected when they’re branded with the specified hashtag, and then they’re displayed in a feed. You can select the winning entry at random from within the database of entries. A major benefit of this type of giveaway is that the method of entry is virtually frictionless: There’s no form to fill out, people just have to post a photo, hashtag it, and they’re entered. On Instagram, a best practice when growing followers is to use 11 or more hashtags on a post. Each hashtag taps into a different audience, so use them strategically to reach a large, general audiences. For example, #cupcakes appears 4k times every hour. #birthday is another relevant hashtag you could use with a cupcake post and it appears 334k times in an hour. Using these hashtags would help the discoverability of your post since you could reach people who are searching for cupcakes or maybe just looking for birthday ideas. Use specific hashtags to tap more relevant but smaller audiences. #atlantacupcakes may be used less often, but anyone searching for the best cupcakes in Atlanta could easily find posts with that hashtag and be motivated to pop into your shop! Remember that hashtag you used in your Christmas contest or giveaway? Those entries can be displayed in a feed on your website, in a Shopify Store, or wherever you like. You can even use individual posts in your marketing efforts (if you have permission from the person who created the post). Here are some of the best (most searched for) hashtags to use with your Christmas giveaway or contest. I found the lists of hashtags below using a free tool called RiteTag (ritetag.com) to see which hashtags are trending now, and to see which will be trending over time. The Christmas and holiday season is just starting to heat up! These tips — and hashtags — will get your contests and other holiday promotions in front of more people during this competitive time of year.